B&B has a ton of potential, which is why we’re excited to not only share this nifty behind-the-scenes featurette, but cover the film as well (keep your eyes open over the next few days to read our official thoughts on the film). It looks unique and promising, and we’re all about unique and promising. While you wait for our official review, check out that BTS feature, in addition to plenty of additional 411 thanks to the press release! 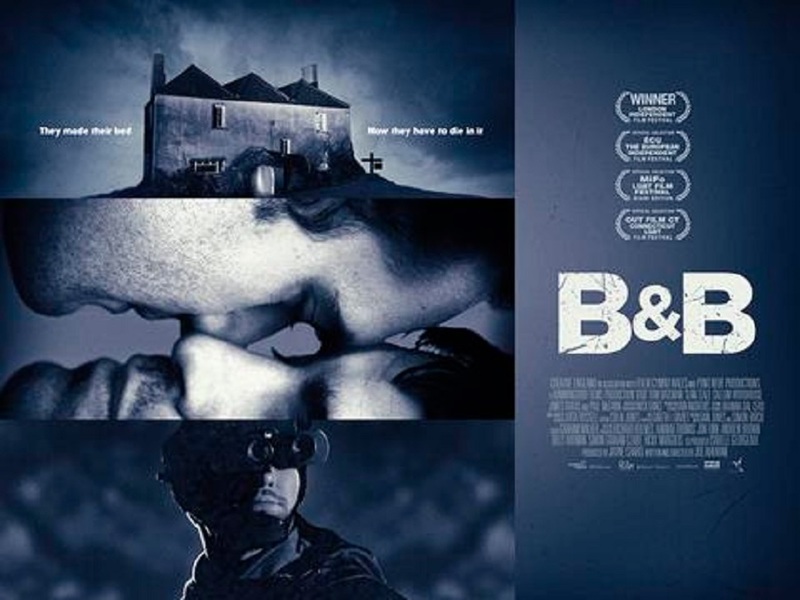 Suspense thriller B&B, written and directed by BAFTA-nominated Joe Ahearne (Trance, The Replacement, Doctor Who) and produced by Jayne Chard (Dartmoor Killing, I’ll Tell You), won Best LGBT Film at the London Independent Film Festival. Distributor Peccadillo Pictures picked up the UK and Ireland rights after its World Premiere at the festival. International rights are still available. Marc and Fred went to war when they were refused a double bed at a remote Christian guest house. They won in court and now they’re back to claim their conjugal rights. Triumph turns to terror when a Russian neo-Nazi checks in. “I wanted to do a thriller in the Hitchcock vein but with gay characters making the wrong choices and getting terrified out of their wits. B&B goes beyond the gay relationship movie. It’s a thriller with a married couple at the centre, something I haven’t seen before,” says writer/director Joe Ahearne. “B&B is a very different kind of gay film and a brutally funny thriller,” adds producer Jayne Chard. The couple is played by Tom Bateman (Kenneth Branagh’s Murder On The Orient Express, Amy Schumer’s Snatched) and Sean Teale (Bryan Singer’s Gifted, Ben Affleck’s Incorporated), and the B&B owner is played by Paul McGann (Withnail & I, Doctor Who). B&B has just played in competition at the ECU Independent Film Festival in Paris and is also playing in competition at the MIFO LGBT Festival in Miami, OUT Film CT in Connecticut and a number of other festivals. B&B is a Hummingbird Films production funded by Creative England, Film Cymru, and Pont Neuf Productions. Director of Photography Nick Dance; Production Designer Iain Andrews; Editor Graham Walker; Music Dan Jones and Simon Birch;Executive Producers Jon Finn, Richard Holmes, Ricky Margolis, Simon Graham-Clare, Hannah Thomas; Co-Producer Isabelle Georgeaux. Marc and Fred exercise their civil rights by checking in at a B&B run by devout Christian Jeff and his teenage son Paul. Jeff has already been successfully sued after he refused them a double bed. Our heroes have come back to demonstrate who’s in the minority now. All goes to plan until a thuggish Russian checks in. Is Alex a fellow gay campaigner or a neo-Nazi come to support homophobia overseas? The gag quickly runs sour as our couple begin to fear they’ve been set up for a beating. A terrifying death occurs but not the one we’ve been expecting. When Marc and Fred uncover a cold-blooded murder they realize they’re next.